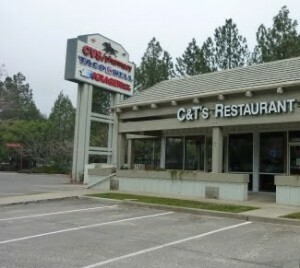 Earlier this week I stopped by C & T’s Restaurant in Pollock Pines, CA, which is located at 6454 Pony Express Trail at the far end of the buildings in front of CVS Pharmacy. I was there to meet with Twila Grasmick who with her husband Chuck, owns the place. I don’t think I have had so much fun at breakfast in a long time, just talking and laughing. “Well, can I get a sample of a few things?” I replied. “Sure,” she said and walked over to talk with the chef. While waiting for my surprise meal, we chatted about lots of things, including how they got started in this business. “I have been a waitress since I was 22, so I am not new at this. Chuck is retired from the Forest Service and for nine years he and I ran the Waffle Shop in Placerville. Then seven years ago we opened this place. For a year and a half we actually ran both places. My breakfast arrive and it consisted of a country fried steak with sausage gravy, a small serving of chorizo and eggs and a portion of their corned beef hash. I started with a taste of the corned beef hash which had a much better flavor than many I have tasted and wasn’t salty, since they cook a real corned beef and cut it up for the hash. I know that because before it arrived I had asked if they used the much more convenient canned corned beef, as some restaurants do. After a few moments of just staring at me Twila smiled and then responded, “No, we cook real corned beef for it.” I have to watch out what I ask. All three samples I tasted might be a bit under-seasoned for some people, which is something I like in a restaurant. You can add salt, pepper, hot sauce or, perish the thought, ketchup if you want, but you can’t take it away if the chef overdoes it. That is the sign of a good restaurant. C & T’s serves both breakfast and lunch. The menu starts with a list of egg dishes (egg beaters can be substituted), which, like their many omelets, come with hash browns or O’Brien potatoes and toast or biscuit and gravy (go for the biscuit and gravy – yum!). Those are followed by pancakes and more, waffles and their house specialties, which includes the chorizo, corned beef hash, eggs benedict and even a breakfast burrito. Finally, there is a list of a number of sides and you can also get smaller servings of many of the breakfast items, no matter how old or young you are. For lunch there is quite a list of burgers and sandwiches. The favorites are the Philly cheese steak and the grilled Reuben (I have to go back and try that one). Many of the sandwiches are also available as a half sandwich. In addition to their Soup du Jour (seasonal) you can have a dinner, chef, taco or tuna salad if you aren’t in the mood for a sandwich. C & T’s Restaurant is open from 5 a.m. until 2 p.m., seven days a week. Breakfast and lunch is served all day. And, they even have a generator that they can hook up to keep them open if it appears the power is going to be out for a while, which makes them especially popular during winter storms. Now that is thinking ahead! If I had to sum this restaurant up in just a few words I would call it a clean friendly place, serving comfort food in a very mellow atmosphere. It just has a nice feeling. For more information give them a call at 530-644-0105.